This user guide shows how to get started with ESP32-DevKitC V4 development board. For description of other versions of the ESP32-DevKitC check ESP32 Hardware Reference. ESP32-DevKitC V4 is a small-sized ESP32-based development board produced by Espressif. Most of the I/O pins are broken out to the pin headers on both sides for easy interfacing. Developers can connect these pins to peripherals as needed. Standard headers also make development easy and convenient when using a breadboard. The board supports various ESP32 modules, including ESP32-WROOM-32, ESP32-WROOM-32U, ESP32-WROOM-32D, ESP32-SOLO-1, and ESP32-WROVER series. The following list and figure below describe key components, interfaces and controls of ESP32-DevKitC V4 board. ESP32-WROOM-32 module soldered to the ESP32-DevKitC V4 board. Longer ESP32-WROVER modules may be soldered instead of the ESP32-WROOM-32. A single chip USB-to-UART bridge provides up to 3 Mbps transfers rates. Download button: holding down the Boot button and pressing the EN button initiates the firmware download mode. Then user can download firmware through the serial port. Reset button: pressing this button resets the system. USB interface. It functions as the power supply for the board and the communication interface between PC and the ESP module. This LED lights when the USB or an external 5V power supply is applied to the board. For details see schematic in Related Documents. Most of the pins on the ESP module are broken out to the pin headers on the board. Users can program ESP32 to enable multiple functions such as PWM, ADC, DAC, I2C, I2S, SPI, etc. Some of broken out pins are used internally by the ESP32-WROOM-32, ESP32-WROOM-32D/U and ESP32-SOLO-1 modules to communicate with SPI memory. 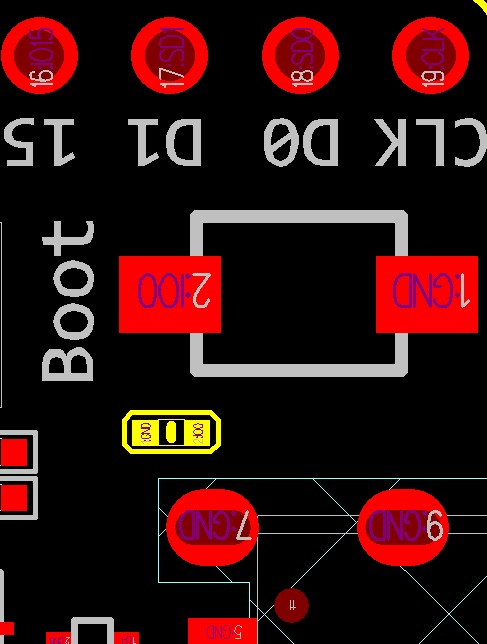 They are grouped on one side of the board besides the USB connector and labeled CLK, D0, D1, D2, D3 and CMD (GPIO6 - GPIO11). In general these pins should be left unconnected, otherwise access to the SPI flash memory / SPI RAM may be disturbed. Above options are mutually exclusive, i.e. the power supply may be provided using only one of the above options. Attempt to power the board using more than one connection at a time may damage the board and/or the power supply source. If users output clock on GPIO0, C15 may impact the clock output. As a result, if users believe that C15 will impact their use of the board, they can remove it completely (please refer to the screenshot below for the precise location of C15 that is colored in yellow). Otherwise, users do not need to concern about C15. Before powering up the ESP32-DevKitC, please make sure that the board has been received in good condition with no obvious signs of damage.